In the Yukon we will need 62% more grid connect electricity in 50 years. 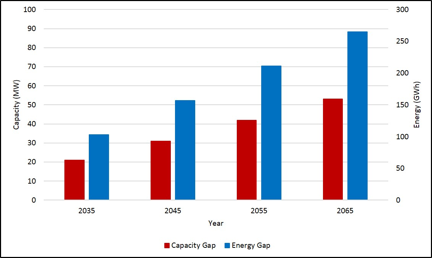 According to the baseline scenario from the Yukon Electrical Energy and Capacity Need Forecast (2035-2065) Yukon will need up to an additional 265GWh of new electrical energy generation and 53MW of electrical capacity generation by 2065. This need is expected to be driven by population growth and increases in per capita electricity use. Forecasts were put together blending historical trends and projections including continued population growth and an average number of mines in operation, based on historical figures. Today as a result of the legacy hydro assets (Whitehorse, Aishihik, and Mayo) in the Yukon we have the least expensive electricity rates in the North. Our rates are comparable to major southern cities like Edmonton and Calgary. In 2014 these clean renewable assets provided 99.6% of our energy needs. The Yukon grid is a self-reliant islanded grid. We must rely on our own resources to meet our needs. On an islanded grid, we cannot sell extra electricity or buy from others when we have a shortfall as we have no transmission line connection to our neighbours. This means we must rely on energy sources that can provide dependable capacity when we need it most – in the cold dark winter. Access to affordable, reliable electricity is crucial for the safety of our citizens and the success of our businesses and communities. We must find a generation solution that can provide electricity we can depend on in our cold dark winters. We use natural resources such as the sun, wind, water and fossil fuels to produce energy. These sources are available to us in different quantities at different times of the day month and year. For example, river flows in the Yukon are typically weakest in the winter months, as is solar energy when we need it most. 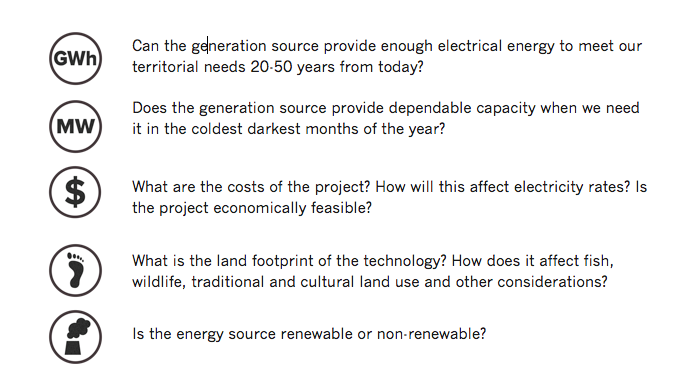 Not all energy sources are created equal and each generation source has benefits, challenges, risks and tradeoffs. We must consider a range of factors.How Does Each Energy Source Compare? 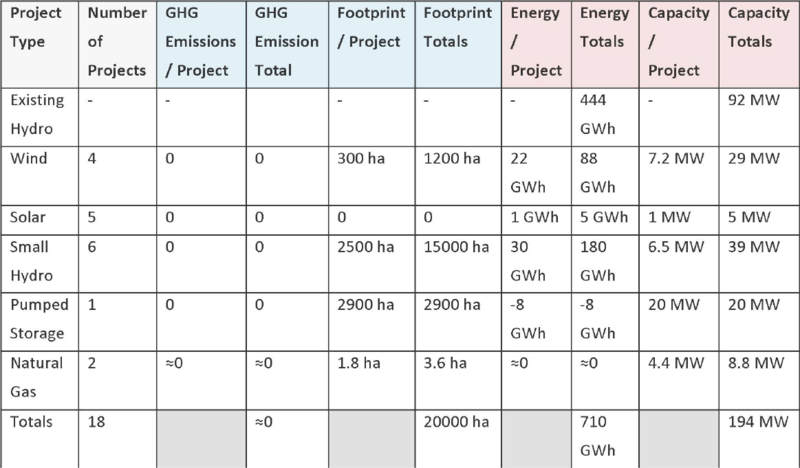 The Putting Next Generation Hydro in Context – Other Solutions to Meet Yukon’s Long Term Energy Future was developed to provide a context for Next Generation Hydro by presenting the impacts and tradeoffs of a variety of alternative supply options. Seven different energy alternatives were compared and then packaged into four scenarios that reflect how each of the energy sources could work together. 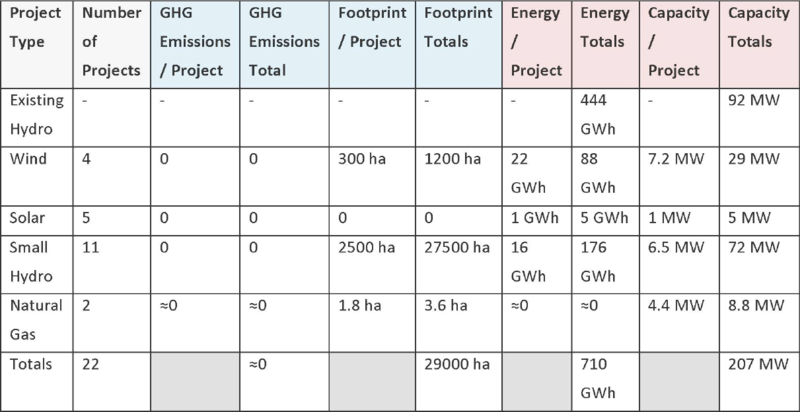 Build a combination of renewable generation resources (excluding pumped storage hydro) to satisfy energy needs. 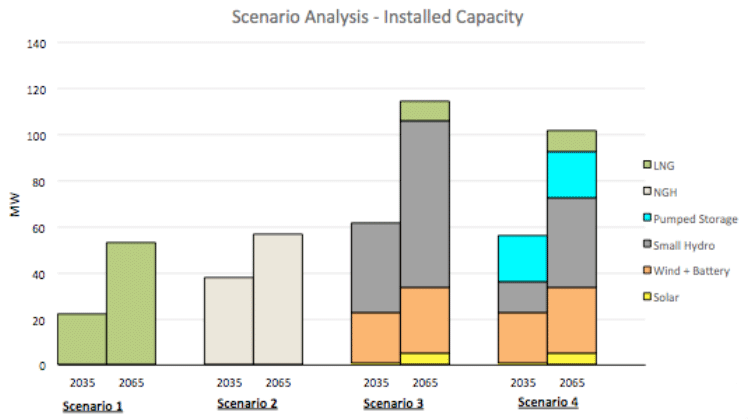 If required to satisfy residual capacity needs, add natural gas generation. Build a combination of renewable generation resources including pumped storage hydro to satisfy energy needs. If required to satisfy residual capacity needs, add natural gas generation. 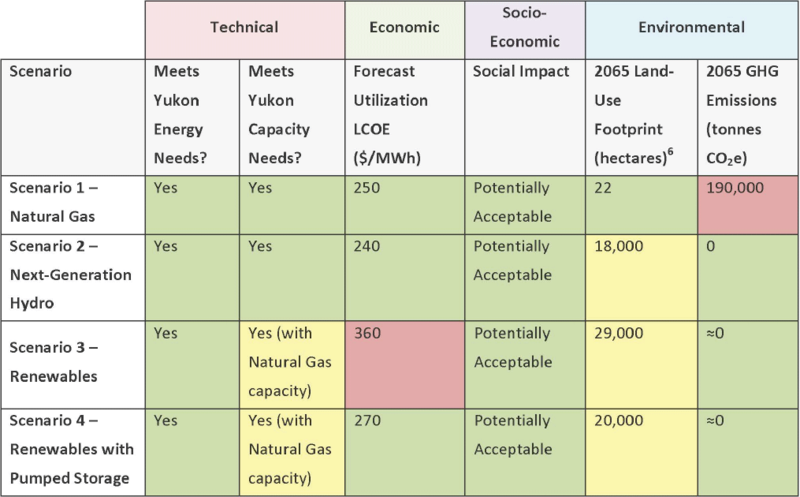 All tables from Putting Next Generation Hydro in Context – Other Solutions to Meet Yukon’s Long Term Energy Needs. 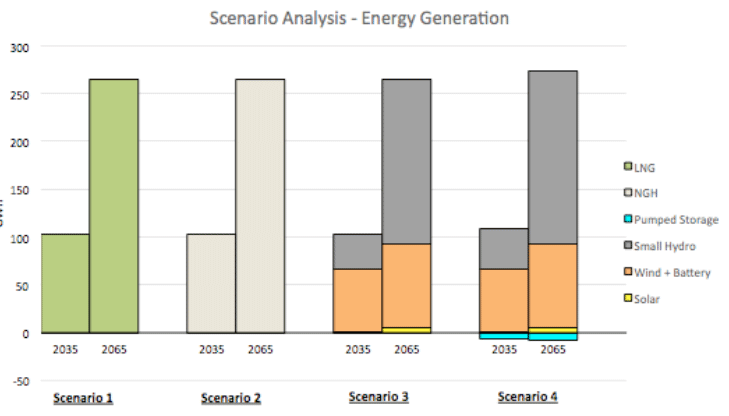 The graphs are a visual representation of how each energy source in the scenarios contributes to meeting future energy and capacity needs.